Haley told reporters at a news conference held at Joint Base Anacostia-Bolling in Washington, DC on Thursday that the Trump administration is focusing not only on the 2015 JCPOA nuclear deal, which has done nothing to moderate Iran’s conduct, but also on Iran’s destabilizing activities, its arms exports and its violations of UN Resolution 2231. “Aid from Iran’s Revolutionary Guard to dangerous militias and terror groups is increasing. Its ballistic missiles and advanced weapons are turning up in war zones across the region. It’s hard to find a conflict or a terrorist group in the Middle East that does not have Iran’s fingerprints all over it,” she said, citing the latest 10-page report released by United Nations Secretary-General Antonio Guterres detailing Iranian compliance – or lack thereof – with UN Resolution 2231. The report, she said, “describes violation after violation of weapons transfers and ballistic missile activity.” The U.S. and its allies declassified sensitive military information to support the UN investigation into Iranian violations, she said. 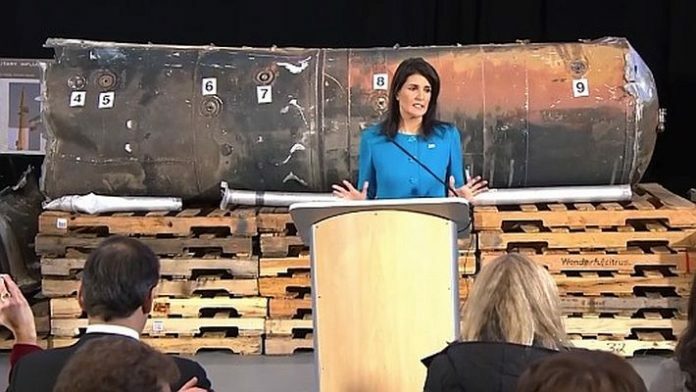 More to the point, Haley exhibited for the reporters a collection of Iranian weapons that were used by proxy fighters to attack civilian targets. Among them was the remainder of the missile that was fired by the Houthi rebels in Yemen who attacked the international airport in Riyadh, Saudi Arabia, a civilian target. “Just imagine if this missile had been launched at Dulles Airport or JFK, or the airports in Paris, London, or Berlin. That’s what we’re talking about here. That’s what Iran is actively supporting,” she said. “There is also material from an anti-tank guided missile. Such missiles have a range of over two miles and can destroy tanks, and even buildings. You will see material from an unmanned aerial vehicle, also known as a kamikaze drone, that can take out radar sites. You will see material from a SHARK-33 explosive boat. These are boats with a warhead inside them that explodes on impact. They can blow six feet wide holes in the hulls of ships. “All of these weapons include parts made in Iran, some by Iran’s government-run defense industry. All are proof that Iran is defying the international community. And not just one time. This evidence demonstrates a pattern of behavior in which Iran sows conflict and extremism in direct violation of UN Security Council resolutions,” she pointed out.